INSTAGRAM; IT’S THE RYAN REYNOLDS OF SOCIAL MEDIA APPS- HOTTER THAN THE REST AND ONLY GETTING BETTER AS TIME GOES ON. With over 800 million active monthly users it’s an ever-growing platform with a real chance of rivalling Facebook itself. A major part of this success can be attributed to Instagram leading the way with the hashtag phenomenon, so much so that if you ask some people what a pound symbol (#) is, they may give you an odd look. With Instagram only getting bigger here are some of the major do’s and don’ts when it comes to Instagram hashtags. Put hashtags into your bio. Seventy percent of hashtags are branded, so if you’re trying to use a unique hashtag to represent your company or business why not put it in your bio? This is a great way to let people know about your hashtag and encourage them to starting using it. Make sure you double-check your customized hashtags. Hashtags have to be all one word and this can sometimes lead to some awkward and embarrassing PR nightmares. This happened in the case of Blackberry phone manufacturer RIM in 2012, when RIM made the decision to expand, taking to social media to look for new employees. They made the unfortunate mistake of using a hashtag consisting of their name, followed by the word “job”, which left the world in stitches and RIM very embarrassed. Put hashtags wherever you personally prefer them. The best place to put your hashtags is a hotly debated. Some people say to put them in the descriptions, others think that’s too cluttered and prefer to put them in the comments. Without any official, extensive studies having been conducted on the topic it’s hard to definitively say which is the better option. The best thing you can do is to simply use your own judgment, and do whatever feels right for your brand- maybe a bit of experimenting will give you a personal preference! Don’t Use too many irrelevant hashtags. Hashtags are the lifeblood of this platform, and you should be using them to bring people to your brand. With this in mind, it is important to be using hashtags that relate to your business. If your brand is about fitness, very few people searching “#unicorns”(1.7 million posts) are going to be drawn in by your content, so stay on brand. Don’t forget that when it comes to hashtags capitalization doesn’t work. 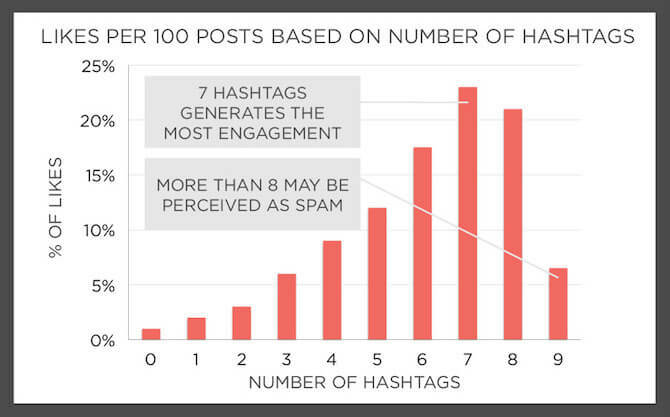 Hashtags are 100% lower case, so keep this in mind when selecting your customised hashtags. If your business has a relatively generic name, such as “The Raw Kitchen”, a hashtag like #rawkitchen will likely get lost in a sea of thousands of home cooks, food bloggers and recipe designers using this same hashtag, who have never even heard of your business before. If you find yourself in this predicament, try going back to creating your own unique hashtags, which won’t get lost in the clutter. Don’t constantly reuse a saved block of hashtags. Coming up with lots of good hashtags is sometimes a hard thing to do. An easy work around for this is saving pre-made blocks of hashtags that you can simply copy and paste into each post. DO NOT ALWAYS DO THIS. While you can get away with it occasionally, if you are constantly using the exact same block for every post, Instagram’s software may flag you as a potential spam account. However, if you still want to re-use saved blocks of hashtags, try creating several different blocks and rotate through them with every post. ← What students look for in a Job/Employer?